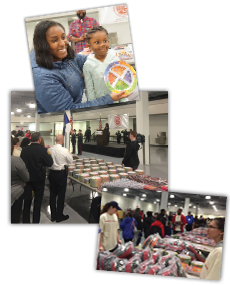 Fresh Baby proudly supported the Project Toy Drop with a donation of our Kid’s 4-Section MyPlate. While we couldn’t be there, it looks like the event was a success! 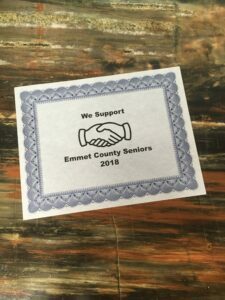 Fresh Baby was recently recognized for supporting the local Friendship Centers of Emmet County on National Senior Citizens Day with a monetary donation. Every week for 8 weeks, Fresh Baby will provide one of our nutrition education products to the After-school Cooking Club at Boyne City Middle School. At the first session this week, students received our Kid’s Comic Book Aprons, which they were stoked about! 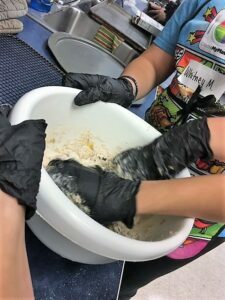 The After-school Cooking Club is a collaboration between Fustini’s of Petoskey and the Rambler Wellness group, with the mission to introduce students to a homestyle kitchen, incorporating food safety, smart shopping, and nutrition instruction along the way. Every week a different course will be prepared culminating in a family-style dinner to be served to the student’s families the last night. This program is made available through the generous donation of time by Chef Jon Kirk of Fustini’s of Petoskey, BCMS teachers Greta Brock and Cindy Romero, and the Rambler Wellness group under the guidance by Sue McClosky, RN. We are proud to support the upcoming 2018, Good Neighbor Food Pantry cooking classes for their clients. The Good Neighbor Food Pantry serves 50-60 families a week and through a grant purchased MyPlate Grocery Bags. To accompany the bags we donated Fresh Baby Fridge Thermometers. Thank you to all of the volunteers at the Good Neighbor Food Pantry for your dedication and hard work, you do it with such compassion and dignity. We are proud to support the upcoming 2018 Manna Food Project Crock-Pot and Blender Cooking Classes. Manna has partnered with the Health Department of Northwest Michigan, Groundwork Center for Resilient Communities, and MSU Extension conduct eight Crock-Pot and eight Blender cooking classes for 400 pantry clients this year. Participants learn safe knife skills and how to customize a nutritious recipe to their personal tastes. Each client brings home a new Crock-Pot or blender, a three-piece kitchen knife set, vegetable peeler, cutting board, measuring cups and spoons, colander, Fresh Baby Fridge Thermometer, spatula, and fresh ingredients to prepare several easy-to-make recipes. Manna Food Project (Manna), a 501(c) (3) non-profit organization, helps feed the hungry in Antrim, Charlevoix, and Emmet Counties. Over 250 core volunteers, seven full-time staff members, and one part-time employee work together to fulfill this mission. Manna is a partner organization of the national Feeding America Food Bank Network. Manna operates a food bank (distribution center), a food rescue program, a weekly food pantry, and the “Food 4 Kids” backpack program. 2016-2018 Fresh Baby is excited to be a campaign sponsor of the Partnership for a Healthier America’s Drink Up Initiative that encourages everyone to drink more water. The Drink Up logo is seen on our Fresh Baby 4 Section MyPlates and a portion of the profit is donated to the Partnership for a Healthier America’s Drink Up Initiative. We are dedicated to encouraging American’s to make the shift to healthier drink choices. 2017 -To embrace the holiday spirit of giving, our team put together Fresh Baby Get Active Kits to donate for Toys for Tots. It was a true joy for us to do this and we hope it brought joy to children in our area for the 2017 holiday season. 2017 & 2018- Fresh Baby is pleased to support the Rotary Club of Petoskey, Michigan and their 2017 and 2018 Diamonds & Denim event, with proceeds benefiting the Petoskey Band Boosters. 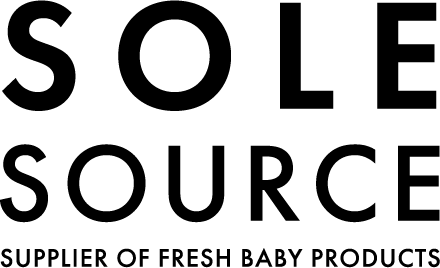 Fresh Baby collaborated with Vilahbloom.com to offer a luxury diaper bag filled with healthy Fresh Baby products for their event auction. 2017 & 2018 -Fresh Baby is thrilled to support the Petoskey’s Connecting Women in Business GO Grant Program for Girl Fundraiser. A donation of Fresh Baby Nutrition Education Products, with a value of over $140.00 was donated to the silent auction, with all proceeds going to the GO Grants. The GO Grants are for young girls in the Petoskey area who have an idea or passion to try something news. The first grants were awarded in 2010 and since that time, 121 girls have received nearly $44,000 in grants. 2016-For several years Cheryl Tallman, founder of Fresh Baby, identifies a local project that leverages the company’s capabilities to improve the health of kids in our community. This year, Fresh Baby chose to support second grade students and teachers by donating fun products and teaching materials that align with the USDA MyPlate Guidelines for healthy eating. The $2,100 product donation will benefit 349-second grade students in the Petoskey and Boyne City School Districts. For the full press release, click here. Fresh Baby was thrilled to support the Great Lakes Energy employee holiday luncheon and auction with the proceeds benefiting Angel Ambassadors for 2016. It is always a pleasure to support local charities. Fresh Baby’s picnic basket of nutrition education products was valued at over $150. November 2016 product donation of 4-Section MyPlate’s, MyPlate and Let’s Move Puzzles, adult MyPlate’s, 4 – to 6-oz. Kid’s MyPlate Dairy Cups and more. A total over $100,000 to support the network…where dreams really do come true! The products were used for Project Toy Drop: Dobbins Air Reserve Base in Marietta, GA.
2016 – Fresh Baby donated a themed gift basket for the 6th Annual Long Island Hospitality Ball with all proceeds of the auction being donated to the Carol M. Baldwin Breast Cancer Research Fund. Fresh Baby participated in the Petoskey Children’s Health Fair, donating our Kid’s Farmer’s Market bags and providing a planting activity for children of all ages to plant peas and start their own garden.